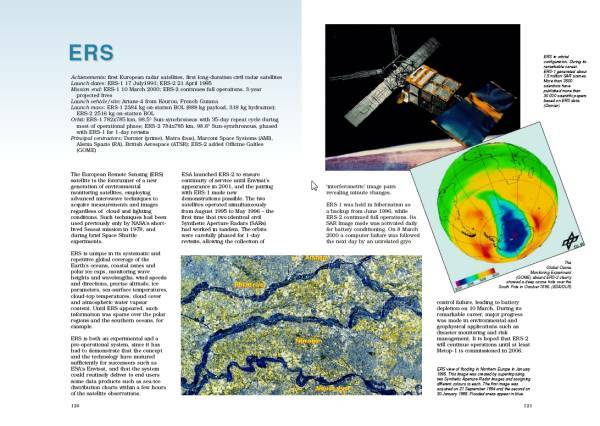 The ERS-1 is a satellite of the European Space Agency (ESA), which was used for remote sensing of the earth's surface. It is no longer in operation. 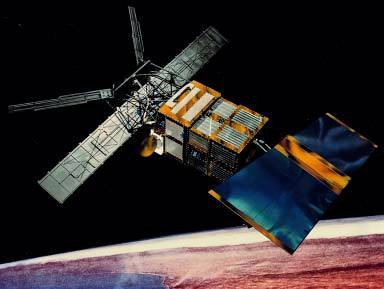 It was developed from 1979 to 1990 and was the first purely civilian Earth observation satellite. The main radar was the Synthetic Aperture Radar (SAR), which was developed under the direction of the company DASA and was operating in C-Band with linear vertical polarization (VV Mode), covering a swath on the earth's surface, which was up to 100 km wide. The satellite travels around 4 kilometers, while an object is illuminated by the radar, which implies that the SAR synthesizes a virtual stationery antenna that is 4 kilometers long! The transmitted pulse with a length of 37.12 microseconds was intrapulse-modulated using linear frequency modulation (LFM) and a bandwidth of 15.55 MHz. This pulse was compressed to a length of 64 ns in the matched receiver. This radar device was able to operate to as a scatterometer also, using a different group of antenna arrays. On board of the satellite there was also a radar altimeter (RA) which was operating at a frequency of 13.8 GHz ( Ku-Band). It used a parabolic antenna with a diameter of 1.2 m and a beam width of 1.3° and could with an accuracy of up to 5 cm measure the height. There are used two different resolution modes for the measurement of either the sea surface or of the ice. The power amplifier of the transmitter was equipped with a traveling-wave tube. The ERS–1 was launched on June 17, 1991, on an Ariane 4, from ESA's Guiana Space Centre near Kourou, French Guiana, into a Sun-synchronous orbit at a height of 782–785 km and an inclination of 98.5 degrees. Its orbital period was approximately 100 min, the repeat cycle 35 days. The mission was ended on March 10, 2000 by a failure in the on board attitude control system, far exceeding of its expected lifespan. ERS-2 was launched on April 21, 1995 as the follow-on from ERS-1, with which it was used in tandem from August 1995 to June 1996, their identical orbits (35 days) having a one-day shift. Because of this delay and the Earth's rotation, the ground-track patterns of ERS-2 are shifted westwards with respect to those of ERS-1. ERS-2 covers the same area from a slightly different aspect angle therefore. By mathematical processing of both pictures, scenery modifications may now be recognized with an accuracy of up to one centimeter. Using this technology, scientists were able to predict for example a mud avalanche from a volcano in Iceland. On July 5. 2011, ERS-2 is put out of service by bringing down to a lower orbit. These deorbiting procedures are done while the fuel is still sufficient to make the careful manoeuvres. The batteries are switched off. An entering into the Earth's atmosphere and burn up is expected to be from 2025.